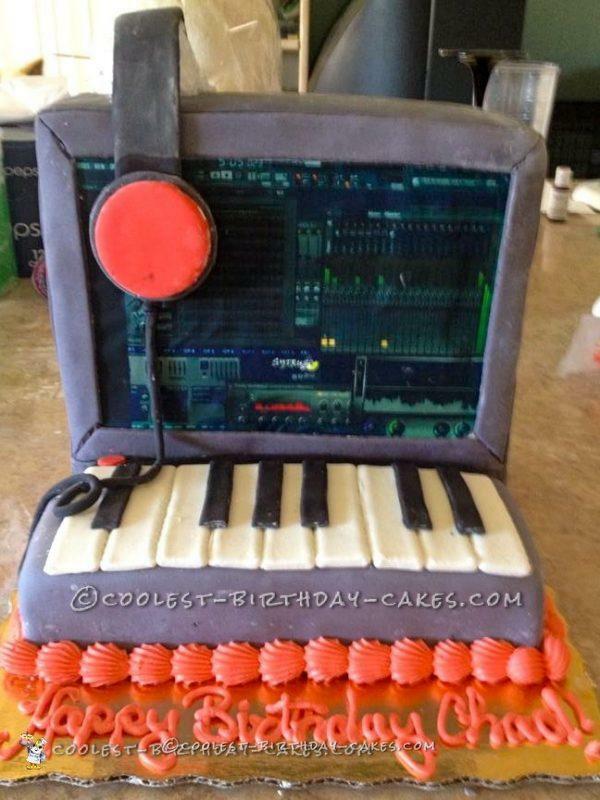 This electronic musician cake was made for my friend’s husband. He makes beats on his computer using a keyboard and this program. She was originally going to go to Publix to have the edible image placed on a sheet cake and then make a pair of head phones her self after I taught her how to do it. As we were shopping for fondant, she said what if you create the cake? I said, “Sure! But if I do, I’m gonna go big!” I told her my idea to create a 3D version, actually stacking layers of cake to make a computer screen. She loved the idea. I have been decorating cakes for over 10 years, but I’d never tackled a cake like this. I had stacked wedding cakes, but that was it. I soon found out this was going to be a challenge. I began by baking vanilla and strawberry cake layers, the flavors my friend requested. When the layers had cooled I started to measure and cut the pieces I needed to stack. My first attempt failed miserably! I was in the kitchen swearing and slamming things at 3 in the morning. I went to bed feeling frustrated and very disappointed in myself. The next morning I woke up refreshed and feeling ready to try again so that’s just what I did. After cooling the new layers, dirty icing, and cutting new pieces to work with, I was ready to try to stack it again. This time it went much better! I stacked 3 4in by 8in peaces on top of each other and draped white fondant over the resulting shape. I also draped the front keyboard piece with white fondant. 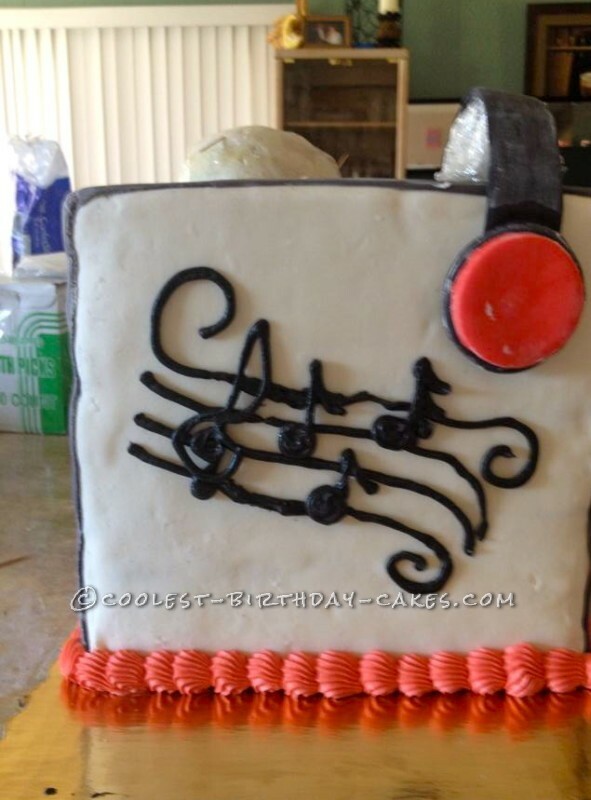 I chilled the cake while I started to create the head phones. The head phones were a trip in a half as well! The first pair were amazing; they came out perfectly! I set them on a mannequin head to dry. Unfortunately, my 2 year old decided to play with them and they broke! So, I made a new pair. That pair broke thanks to my own inpatient hands. I tried to move the headphones before they set up, and they snapped. You know what they say, third time’s a charm! I made the third pair a bit smaller, which worked better not only for the headphone’s survival but also for the size of the cake. The rest of the cake came together very nicely. The computer screen is an edible image I had printed at the local store. I placed that on the cake and then used my fondant to create the frame of the computer and the keyboard. When that was done I still had a white back on the computer and realized I had run out of fondant. Instead of making more fondant, I decided to pipe music notes on the back and they looked great! I finished it all off with a red shell border. At the end of the 3 days it took to make this cake I was so proud! Now I can’t wait to create another challenging cake design!